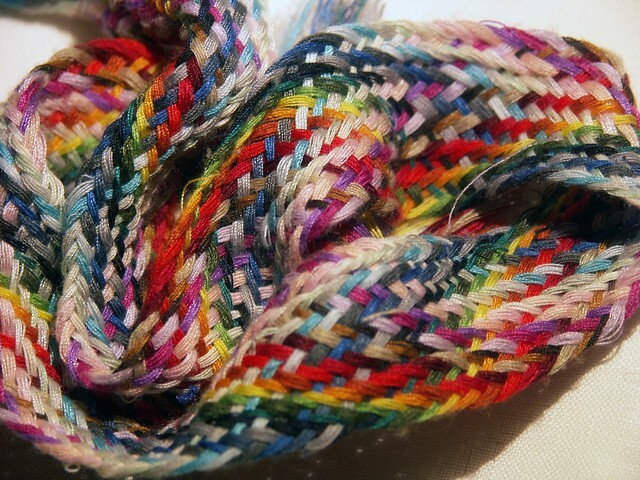 This woven band of threads is perhaps my favorite studio tool or supply. It's 23" long and perfect for appliqué. When I need a specific color to sew with I can pick a single strand and easily pull it from the band. I bought it maybe 15 years ago and it never seems to run out. I can't find this item in sewing stores anymore. Does anyone else have one? Have you seen anything like it in a shop recently? Any ideas on how to Goolge it? where the one guest is you. In the softness of evening it's you she receives. You are the partner of her loneliness, the unspeaking center of her monologues. With each disclosure you encompass more and she stretches beyond what limits her, to hold you.